They are expert climbers, swimmers and hunters. Their keen eyesight assists in stalking their prey but because they are short-winded they sometimes are unable to sustain an extended chase. The tufts of hair on the ear tips serve as antennae, increasing the animal’s ability to hear the slightest sound. If these are removed, hearing declines. 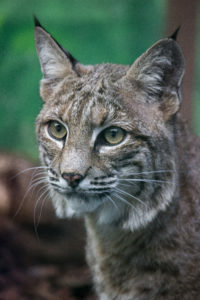 Bobcats can leap up to 10 feet.